The narrative may have given this record a big boost to get the message out, but there is no denying that DYING STAR runs deep with stand-alone qualities. 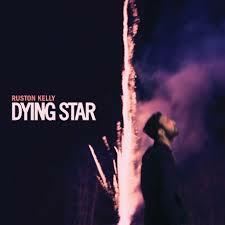 Across the fourteen tracks that form the debut album from Ruston Kelly there is sufficient tuneful content to keep you in the game and demonstrate that you are in the midst of a performer ready to make a splash. Once the rugged persona takes grip, you embark on a virtual road trip across dusty terrain and a nod to the trusty troubadours who have trodden the wearisome path of song writing soul searching. This is music teetering on the fault line where country meets folk meets tempered rock. Whilst engaging most of the time, the ebb and flow nature does enter a midway lull suggesting the message could have been transmitted in a more compact package than a lengthy fifty-three minutes. Like all records that tempt you into multiple pleasurable spins, its opening gambit plays a winning hand with the decent combo of ‘Cover My Tracks’, ‘Mockingbird’ and ‘Son of a Highway Daughter’ laying the groundwork effectively. The middle track of this trio has set the pace in the album’s promotion race and possesses enough memorable hooks to linger long after first listen. However, these three songs eventually bow down to the track ‘Faceplant’, which glistens at the album summit. A hint of Justin Townes Earle (well one his songs anyhow) seeps out of this one to rack up the bonus points and supplement the great melody that furnishes the composition. A upside of this review overrunning the release date came in the form of ‘Big Brown Bus’ manoeuvring up the track rankings with a growing case to boost the record’s overall lasting qualities. While the lull does take a slight hold in the latter stages, ‘Jericho’ pops up to revitalise the album and ensure the credit column is heavily populated. Enough steel and harmonica feature when you want it and a general mid-tempo feel ensures the record can be a welcome side accompaniment when you feel like a piece of contemporary Americana. Ruston Kelly’s song writing skills may have had a fruitful past, but like other writers branching out into the solo performing world, a little extra in the tank has been held back to fuel a push to a bigger platform. Without the narrative and association, DYING STAR would still have made me sit up and take notice. It can take its place among the valuable additions in the 2018 release gallery and is likely to canter along for a while yet. More of Ruston Kelly will be certainly heard in the near future and he has earned the right to take the plaudits for his debut album.